Reflexology is much more than a foot massage, it is extremely relaxing and reviving, but by the therapist applying gentle pressure to specific areas on your feet, your whole body can be healed bringing homeostasis – balance within your body and mind. This gives you an overall feeling of being relaxed and at ease in life, letting go of any stress, anxiety, tension and can even remove pain you may be experiencing. So Kick Your Feet Up and Get Healthy! 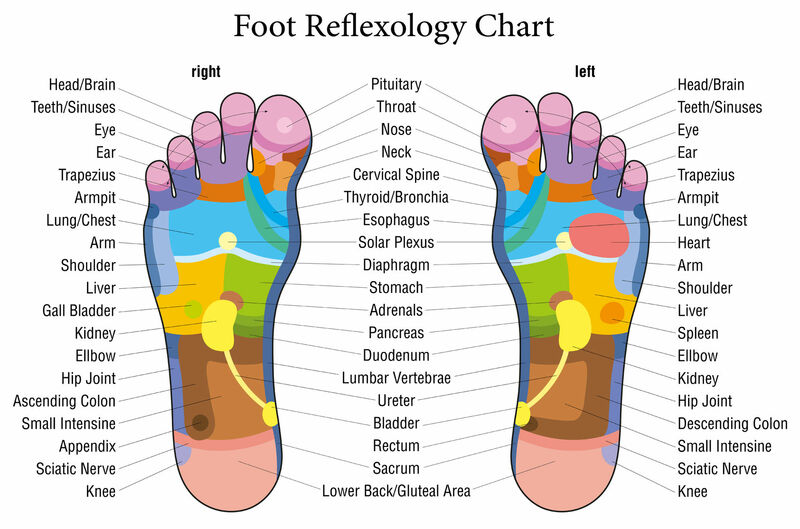 Some of the benefits of reflexology include its ability to stimulate nerve function, increases energy, boosts circulation, induces a deep state of relaxation, eliminates toxins, stimulates the central nervous system, prevents migraines, cleans up urinary tract conditions, speeds recovery after injury or surgery, helps relieve sleep disorders, reduces depression, and relieves pain. Furthermore, it can help ease the treatment of various cancer’s and even helps to soothe the pains of pregnancy, even those occurring after the baby is born. Relaxation: Reflexology has been known to open neural pathways, and this sort of free-flowing neural activity results in a more relaxed state in the body. Reflexology floods your system with relaxation, inducing a state of calmness and tranquillity throughout your body and mind. Nervous System Stimulation: The open neural pathways can benefit our central nervous system in a variety of ways, not only will our brain be able to handle the inputs more effectively, thereby speeding up our cognitive powers, but our physical reactions will be faster, our memory will be boosted, and generally, our entire brain will simply work better and faster. Pregnancy and Menstruation: Studies have shown that reflexology can be very beneficial for pregnant women, particularly in terms of labour lengths and their need for analgesics during labour and post-partum recovery time. Beyond that, due to many of the health benefits already outlined above, it can reduce the chances of post-partum depression and can also help a woman’s body heal itself faster and get back to its normal metabolic activity quickly.